At the Grand Lake Golf Course near beautiful Rocky Mountain National Park and the scenic town of Grand Lake, you can learn to play the game of golf on a serene golf course. For the advanced player, lessons are individual; helping you to improve your score. Whether you need help on your long game or your short game. For the beginner player, education takes you through proper club selection and course strategy to ‘The Rules of Golf’ and golf etiquette. All ability levels are encouraged to join us to learn the enjoyable game of golf for a lifetime of pleasure and personal gratification. 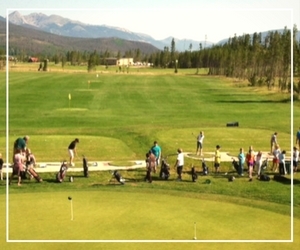 Group Lessons meet at the driving range every Monday at 11 am during the main summer season. No reservations needed. 2018 group lessons will begin on June 4 and focus on a different technique each week. FREE group lessons each Thursday at 9 am for children ages 7-18. Juniors meet at the practice area. Clubs and balls are available free of charge. The 2018 lessons run June 14 until school resumes. Reservations are encouraged but not required; call 970-627-8008 to RSVP. Custom Clinics are available. Contact the Golf Shop for information regarding scheduling a custom clinic for your group outing, special event or tournament: 970-627-8008. Call the Golf Shop to make your lesson appointments at 970-627-8008.